Happy 1st Birthday, Beautiful Girl! 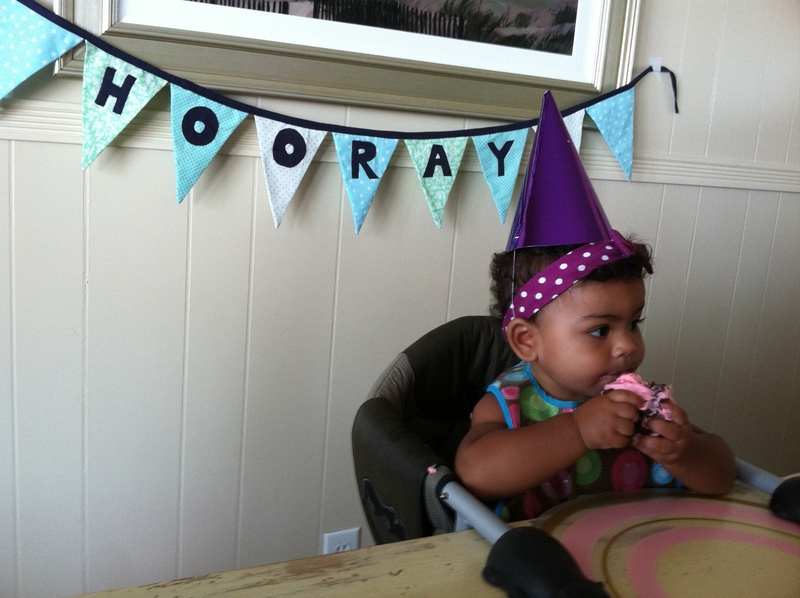 Our joyful, sweet, precious daughter turns 1 year old today. I am so excited to celebrate her today! The joy she brings into my life everyday is way beyond what I had ever imagined. She makes being a mom such a delight. Why Aren’t More ‘Fertile’ People Adopting? This is a difficult post to write because it’s such a touchy subject. But I need to get it out: I hate that adoption seems to be linked to infertility 90% of the time, at least in people’s minds. I don’t have any problem with infertile couples adopting. If medical intervention isn’t their thing, or they’ve tried that and had no success, many couples who are unable to conceive turn to adoption. I think birth mothers who are unable to parent their children (and willingly surrender their rights) like to know they’re helping out a couple who couldn’t become parents without adoption. That’s all fine and dandy. My problem is the assumption that adoption is (only) for people who can’t have babies biologically. It bothers me on two levels. First, quite a few people have made the assumption that Jason and I really wanted—or still want—to have children biologically and we turned to foster care and adoption as a Plan B. They say things like, “Maybe you’ll get pregnant after you adopt! That’s what happened to my second cousin” and “We adopted two kids and then my wife finally got pregnant after 7 years. You never know!” It’s always said with kindness and sympathetic smiles. But, in our case, we felt like we were supposed to become foster parents and open our hearts to adoption and put the idea of having biological children on hold. Perhaps, indefinitely. I don’t know if we will ever have a child biologically. Honestly, at this point, I have no desire to become pregnant. We have chosen a different route to building our family. Second, and the main reason I have a problem with the adoption=infertile assumption, I would LOVE to see more kids adopted. My passion is for the orphans in our own country, though there are millions around the world waiting to be adopted, too. There are over 130,000 kids in the United States with their mugshots next to short biographies on photo listings, desperately waiting for parents who will adopt them. Another 300,000 kids in foster care need loving, stable, temporary (but potentially permanent) homes. I don’t have patience to wait for 130,000 infertile couples to exhaust all other possibilities and get desperate enough to consider adopting an older child. And the kids don’t have time to wait either. Every year, 24,000 of them turn 18 and get pushed into adulthood alone, unprepared and unsupported. It’s tragedy upon tragedy. We need some of the millions of fertile couples in this country to join us on the adoption road! or call your county Department of Childrens Services (Dept. of Human Services in some states, I think) and ask about becoming a foster parent. Everyday I’m in awe—not just with how stinkin’ adorable my daughter is (of course, I’m biased)—but that I get to be her mom. I’m fully aware that things could have turned out very differently for us all. Thankful doesn’t seem like big enough of a word. This journey hasn’t been easy. We had some really trying times back in October and November. But everything now is so…easy. And fun. Do you see that giant smile? Everyday we get to soak up that joy that oozes out of her and we could almost forget how difficult things were at the beginning with the DCS drama. And like her older half-sister, she could have been bounced around from foster home to foster home before being adopted. But we are thankful for the way this chapter is turning out. We are thankful for her. And thankful for this season of fun and easy. I’m eager to get back into foster parenting. Having our home “closed” is hard. Even though it’s the easy road. It’s hard because we signed up for the challenge; and now we’re not doing it. I suppose in a way we’re still doing it. Precious came to us through foster care (though she ended up being removed from state custody and put into our custody) and we still haven’t finalized her adoption…but it just doesn’t feel like we’re doing enough about the foster care situation. There are so many kids still out there in our city that need good foster parents. And I want to help. I probably need this forced break more than I want to admit. It’s time for the three of us—me, Jason and Precious—to bond as a family. We were still reeling from the situation with Ladybug in a lot of ways and this break from foster parenting gave us time to process all of those feelings. By the time our new home is finished and we’re ready to reopen (late summer or fall, hopefully), Precious will be over a year old. We will be a very different family than we were last July (when we were first certified) and it was just Jason and me. There are a lot of things to think about and different ways to prepare this time. We have our daughter to think about now—what is healthy and safe for her—when we consider welcoming new kids into our family. Sorry for the rambling. I’m sleepy and I was just going to post pictures to publish in the morning. Then I decided to pour my thoughts out and try to make sense of them here. I don’t have a neat little conclusive bow for this. I’m very thankful for our daughter and I’m thinking a lot about our future as foster parents. I was trying yet again to bring it up subtly, to work foster care statistics naturally into conversation. I don’t remember which freshly learned fact I was offering. Maybe I said, “Did you know there are half a million kids in foster care in the US? And over 200,000 of them are waiting to be adopted.” Or I may have been explaining why the Adopt US Kids lists rarely showed infants and young kids on the waiting-to-be-adopted lists—because they were usually adopted by their foster parents; because the foster parents the kids already know and trust are typically offered the first opportunity when the kids become legally free to adopt. Perhaps I was mentioning how it doesn’t cost anything to become a foster parent, the government even pays a small daily board rate to help with expenses, and that adoption through foster care is practically free. Jason looked at me from across the dinner table with tears welling up in his eyes and said, “I can tell this is something you really want to do. Why don’t you go ahead and take the first step—call whoever you need to call to find out what we need to do to get started.” After our previous foster parenting conversation (when we talked about how heartbreaking it would be and how it wasn’t really in our plan), he had agreed to think and pray more about it. Maybe this was something God was putting heavily on our hearts for a reason. I was amazed at how quickly Jason had warmed up to it. I had expected more resistance to this crazy idea to become foster parents and now I was wondering if I really was ready to practice what I had been preaching. Later that evening an intense headache came upon me—the kind that makes me want to just curl up in bed and do nothing. What if I had a child right now? I wondered. How could I care for someone else who is dependent on me when I don’t feel like I have the strength and energy to do anything for anyone else besides myself right now. What was I thinking? How in the world am I going to have the energy to not just care for a child, but care for a child who is coming from a difficult past with the potential for all kinds of behavioral and emotional problems? I have no experience as a mother. I’m not good enough… I’m not strong enough… I’m not selfless enough… Those thoughts rolled around in my head as I tossed and turned all night. I will show you how much I can do for you. you will never know the thrill of seeing Me work through you. I empowered you to live beyond your natural ability and strength. against the challenges ahead of you. The issue is not your strength but Mine, which is limitless. By walking close to Me, you can accomplish My purposes in My strength. My feelings of self-doubt and inadequacy melted away as I stepped off the ledge into the unknown and started the most challenging, rewarding, stretching, joy-filled, faith-building year of my life. Thank God for giving me the courage to take that first step in obedience and for working through me despite every shortcoming. • Plan the flight time according to your kid’s schedule. For Precious that just meant not too early so I wasn’t waking her up at 5:00 am to leave for the airport, (lesson learned from Ladybug…) and not too late so we got home just a little later than her normal bedtime. • Pack some new, time-consuming toys for the flight but avoid noisy games for the sake of the other passengers. Also soft toys if your toddler likes to throw things at people. (Ladybug…) Precious had a lot of fun with a rattle but she can’t hold anything for long. I used a pacifier clip to hook the rattle onto her bib. Worked like a charm. • Drinking helps a little one’s ears pop. Descending is the worst time for ear pressure. Plan a bottle feeding for a younger one or reserve some tasty drink for a toddler until the last 20 minutes of the flight. As soon as my ears started to pop, I started making her bottle. • Bring a big ol’ bottle of water from the outside world. If you insist that it’s for making bottles for the baby, security will test it and allow you to take it through. Much cheaper than buying a bottle of water in the airport. If you put all of your liquids in a separate bin (outside of your carry on) it makes it faster. • Bring a small, cheap, sturdy, umbrella stroller. I love the Jeep one we got for $5 at a yard sale. It’s compact and lightweight but has big rugged wheels and steers easily. Most importantly, because we didn’t pay much for it, I wouldn’t be upset if it was broken or lost after being gate-checked. The people at Southwest were sweet enough to set it up for me before we got off the plane both times. • Pack as light as you can. This required a lot of planning for me. Knowing I would need my hands free to get Precious through security and onto the plane, I opted for a backpack as a diaper bag/purse and I checked 1 large suitcase for both of us. I think every airline allows you to check a car seat at no charge. (See below about car seat drama.) Between the backpack and the stroller, I was able to do everything I needed to do—check bags, get through security, buy dinner. Once I had my checked bag back, I could push the stroller with one hand and pull our big suitcase with the other. It wasn’t easy but it worked. • Keep a change of clothes in your carry on—for both of you. If I had needed to change, I would have looked pretty silly in my tank top and knit shorts, but they were small and compact and would have been better than being covering in baby poop through a flight. I also packed 1 extra outfit, 1 set of sleeper PJs, and a few extra bibs and burp cloths for Precious. Four or five diapers and a small pack of wipes don’t take up too much space. I also tuck a few ziplock bags into the diaper bag (all the time) for stinky, soiled clothing. Our flights were less than 2 hours so we didn’t need to use the on plane diaper changing station in the bathroom but a friend who is experienced in international travel with her kids gave me this tip: Once you pull the changing table down, there is no room to move so just bring the diaper and wipes into the bathroom with you—not the whole diaper bag. • Bring your own car seat, if possible. I decided I’d rent one from the rental car agency since they told me it would be free with my AAA membership. Upon arriving to pick up the car and car seat, I was informed that it would be $85 to rent a car seat for 5 days because my rental was not reserved through AAA. More than we paid for both our car seats combined! That’s a pretty freakin’ expensive miscommunication. Thankfully, after getting past the rude and persistent clerk, the manager waived the fee. However, it was a brand new, unfamiliar car seat and it took me over 20 minutes to figure out how to install it properly in the rental car and how to adjust it to Precious’ size. Lesson learned: I should have just brought our car seat. It would have been free, already the right size, I know how to install it quickly and it wouldn’t have been that big of a deal to strap it to my big rolling suitcase. • Have fun! Be flexible and relax. Not everything is going to go according to plan. It will all work out. Remember, you’re on vacation. There are some more extensive, detailed tips for airplane travel with small kids here. On Saturday my sister-in-law Ginger suggested we go to the Opryland Hotel to look at the Christmas decorations with the babies. My bro-in-law Dan, our friend Leila, her son Jaron, and my mom also came along. It’s a beautiful, huge hotel with massive indoor gardens, fountains, and even a river. And they really do it up for Christmas. I didn’t take a lot of pictures but I got a few good ones and Leila sent me some of hers. Leila took this one of my mom holding Jaron and me with my baby. Precious reached out and took Jaron’s hand right before the picture snapped. So sweet! Eliza is a tiny toddler. I love it! She’s 10 months old and a wee bit smaller than Precious but she’s going to be taking her first steps (without help) very soon. What really struck me when I saw this picture is how much our lives have changed this year. My niece Eliza was born in February, our daughter was born in July and baby Jaron was born in October. Each came into his/her family a different way: born biologically, through foster care and through an agency adoption; respectively. We all became mamas this year—couldn’t have planned that better if we had tried. Also, I find it particularly amusing that these three babies are vanilla, caramel and chocolate.